Ideas and Ideas and Ideas…..
My project at Change School St Mary’s Catholic Primary is up and running. We have had out first training day at the Totem Pole and have had our new technologies training yesterday. Hence the appearance of my new blog and twitter account. On our first training day at the Totem pole we learned about “awe and wonder” and active learning. There was a lovely atmosphere as we all got to know each other and there was a sense of great expectation of what was to come. That night when my boyfriend asked how my day was he was interested to hear that “I spent the day in a hut in the middle of a forest, had my fingers taped to together then shouted at for not cutting a picture of a teddy bear out correctly”. I’d like to point out at this stage that this was an example of bad practice! Today was the first planning day with our partner teachers, Chris and Anne-Marie. It felt like such a luxury to have a whole day to discuss ideas and to be working with teachers who were fully committed to a partnership. The outdoor space was selected as an area to develop during the project. To my delight everyone seemed to like my ideas for using unusual materials during the first delivery session. (You’ll have to wait and see!) The active learning approach has given me a sense of freedom to not worry too much about a pretty outcome to an activity and I am excited to see how the how the children manipulate the materials. I was really happy to see the planning sessions true value when I suggested an idea to help the children share their project with the rest of the school but it was already being used in the school. This then sparked a much better idea from Chris. We came up with an idea which could be fantastic for creating awe and wonder. Some kind of vessel which has lots of “secret” compartments in it, lots of different doors with various opening methods. The children would be free to explore this and find objects inside it. This idea is truly versatile, the objects placed inside can be themed to current topics, the children could place objects inside for others to find. I hope the object would create a sense of excitement with the children wanting to see what will be in there next. This idea was inspired by the training at the totem pole where we were invited to look under a wicker basket to see what interesting object was underneath. This led me to remember an installation I once saw at Swanson Art Gallery, Thurso. The installation was made up of a series of full size doors, you could open the doors and inside were small rooms with strange objects in. I can remember one that had a mirror inside and it gave you such a fright as you opened it. After talking to my Mum to see if she can remember the name of the artist (sadly she can’t) I have discovered that I saw this work over 20 years ago when I was about 8. The memory of this work is very clear in my mind, I think this is because of the excitement of exploring it and the fact that it was an experience. This is the feeling that I hope the new piece of work for St Mary’s would achieve. I feel very lucky to be working with a woodcarver/sculpture (Ian) to collaborate with and bring this idea to life. 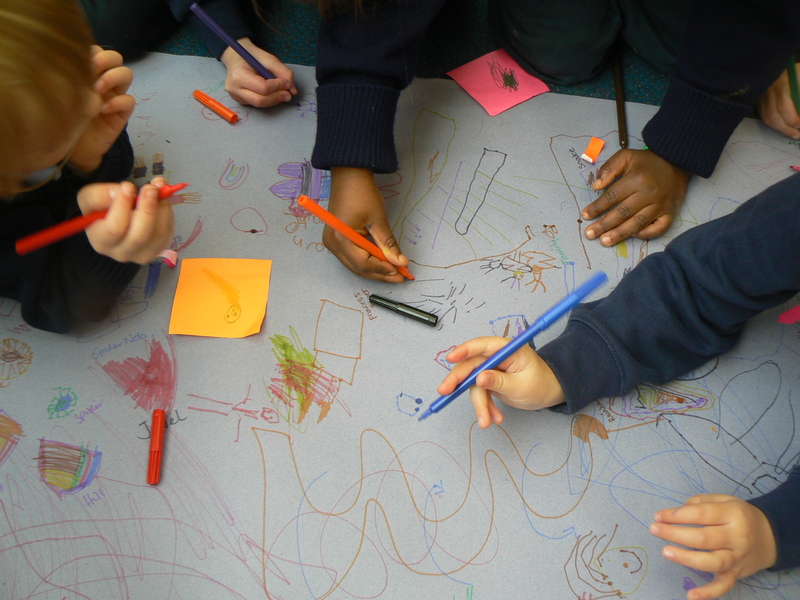 As part of active learning, the themes and ideas should come from the children’s own interests. With this in mind I thought that the children should have the opportunity to doodle in a sketchbook and discuss ideas just as I had. My partner teacher Anne-Marie and I lay down some paper in the classroom and continued our conversion about ideas for work. Almost instantly the children were interested in what we were doing and were extremely keen to get involved. We talked about what we would like to make for the outdoor space. As we watched and chatted to the children, themes of hiding places, such as caves with monsters in and tunnels that go to the moon, appeared on the page. This is something I hope to develop as the project progresses. This blog will hopefully give you an insight to what happens before the “final images”. All the decision making, mishaps, collaboration, work progress that you wouldn’t normally see. Wish me luck !